The £25 million Guardbridge Energy Project moved a step closer to completion recently when the Vital Energi project team took delivery of the 6.5MW biomass boiler furnace which made the 1,300 mile journey from manufacturers Jernforsen who are based across locations in Sweden. The furnace manufacturer was undertaken at Jernforsen’s own manufacturing facility in the remote town of Järnforsen. The biomass boiler and furnace is 10m high, will weigh over 130 tonnes when operational, with fuel, and it is capable of generating heat above 1000°C. The furnace will be used to generate high temperature flue gases, which pass through the exhaust gas heat exchanger generating medium temperature hot water (MTHW) within the energy centre. The MTHW passes through a system of heat exchangers generating the low temperature hot water (LTHW), which will be pumped through a district heating network to the North Haugh campus, where it will deliver heat and hot water for the next 50 years. When completed, the project will deliver approximately 6,000 tonnes of CO2 reduction per annum. The use of LTHW minimises system losses through the heat network and operational construction costs of the heat network which is designed to operate at pressures in excess of 16bar. The Guardbridge Energy Scheme is a 75-week project which sees Vital Energi retrofit a state of the art energy centre into the former paper mill alongside a 14 mile district heating network which will connect to 37 buildings and plant rooms. 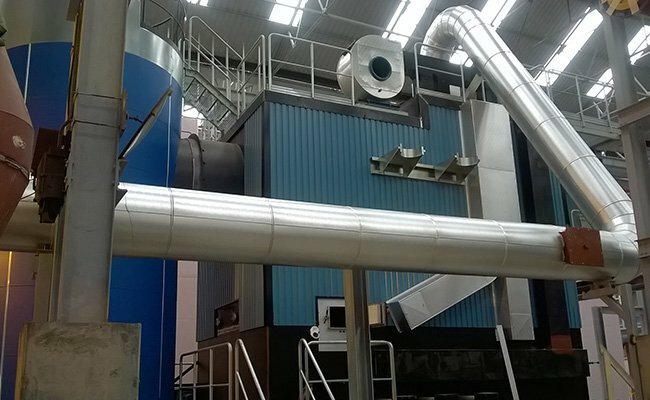 The boiler can produce heat in excess of 8MW and will achieve 87% efficiency at full load conditions. Catch up on the latest Vital news and industry insights, all in one place. Copyright © 2013/2014 Vital Energi Ltd. All rights reserved.